No two Hidden Fence Systems are alike. Each system is tailored to a customer’s specific needs, whether you own a small courtyard, Suburban block or large acreage; Size doesn’t matter. Even native wildlife can be better protected. Unlike conventional fencing, our hidden fence goes practically anywhere—thoroughly, rocky terrain, heavy bush areas, even under water. Hidden Fence professionals are updated on the latest installation techniques to maximise the effectiveness of the hidden fences ability to contain your pet. Dog Containment systems need careful consideration regarding placement and programming. Not being aware of these considerations when installing can adversely affect the outcome of your dogs welfare. 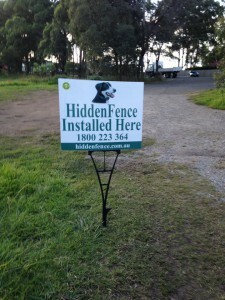 Trust Hidden Fence to ensure proper installation and fitting. Our professionally trained representative will install your system so that it is hassle free for you. We come fully prepared with all the tools to accomplish the installation neatly and quickly. We completely customise your new system so that it keeps your pet in and at the same time satisfies your specific needs. We can keep your pets from swimming in the pool, getting in your precious gardens, climbing trees and at the same time allow them access to some, or the entire property, rivers and dams without the fear of them running off. The combination of the Hidden Fence System and behavioural training is a powerful tool to keep your pet home. Hidden Fence has developed specific training and conditioning techniques to maximise the dogs understanding and clarity of what’s expected while minimising the consequences of the stimulation both in frequency and delivery. Since all of our training is performed on-site, we will attempt to discover the underlining reasons why your pet is escaping, and incorporate a balance between consequences and positive reinforcement training. This is crucial for your pet to learn his new boundaries on an invisible dog fence containment system. Only this balance will successfully contain your pet safely, and above all else, humanely. 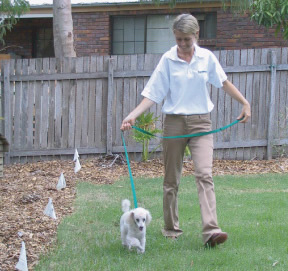 We offer only personalised on-site pet training to guarantee positive results.